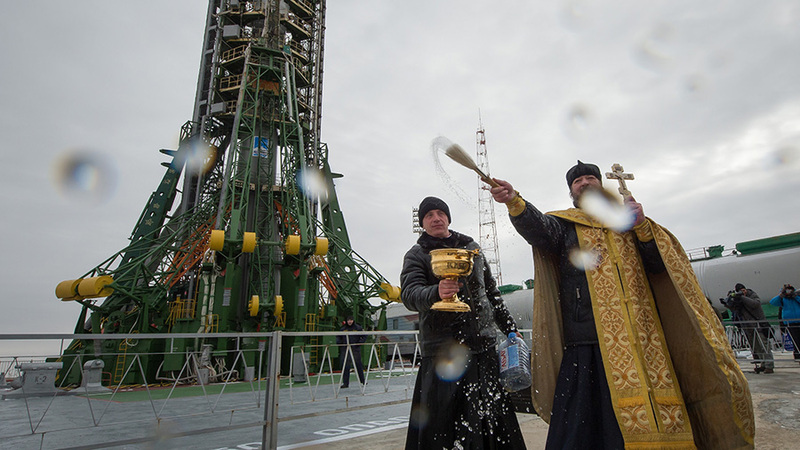 The Soyuz rocket that will launch three new Expedition 50 crew members to space Thursday was blessed at its launch pad today. Back in space, the Canadarm2 grappled the Cygnus cargo craft ahead of its release early next week. An Orthodox priest performed the traditional blessing of the Soyuz MS-03 spacecraft today before its launch to the International Space Station. Peggy Whitson of NASA, Oleg Novitskiy of Roscosmos and Thomas Pesquet of ESA are in quarantine at the Cosmonaut Hotel in Kazakhstan and are scheduled to liftoff Thursday at 3:20 p.m. EST on a two-day trip to their new home in space. The new trio will dock to the Rassvet module Saturday afternoon and join Expedition 50 Commander Shane Kimbrough and Flight Engineers Sergey Ryzhikov and Andrey Borisenko who have been in space since Oct. 19. The new Soyuz crew ship will make four spacecraft docked at the orbital complex before the Cygnus resupply ship departs two days later. Cygnus will end its month-long stay at the Unity module on Monday when Kimbrough commands the Canadarm2 to release the cargo craft at 8:20 a.m. NASA TV will broadcast the release and departure of Cygnus beginning at 8 a.m. Before Cygnus begins its fiery reentry into Earth’s atmosphere it will stay in space a few more days to release a set of ocean ship tracking CubeSats and conduct the Saffire-II spacecraft fire study.